With Wiggelaar you can hire professional moving lifts in Amsterdam, even if you do the removal yourself. Moving heavy items to and from the top floors of your house is made much easier by using a moving lift. You do not have to carry heavy boxes and large pieces of furniture up or down the stairs; the moving lift ensures that your belongings reach street level easily and safely. With Wiggelaar you can hire different types of moving lift in Amsterdam. Since every situation is different, there are lifts with different capabilities. Depending on your situation, you can choose a motor lift, electric lift or self-assembly lift. All moving lifts are provided with air cushions to prevent damage. Arrival time at loading address up to departure from unloading address + 0.5 hr driving time up from and back to the garage, minus the breaks. For removals outside Amsterdam the time is calculated from Wiggelaar garage to garage minus the breaks. The first 50 km are free, additional kms are charged at € 1.00 per km. Example: arrival at loading address 10:15h, departure time from unloading address 13:30h = time worked 3.25 hrs + 0.5 hr for driving up from/back to garage within Amsterdam = 3.75 hours. We have had a coffee break of 0.25 hour, which is deducted, resulting in a calculated time of 3.50 hours. If we do the removal together with you, unfortunately we cannot arrange an insurance policy for you; if you wish, you can take out such a policy yourself. If Wiggelaar takes care of the entire removal for you, i.e. without your cooperation, then we can apply for a Guarantee Certificate of the Recognised Movers for your removal. In that case you are insured for € 100,000; the cost of the Guarantee Certificate is € 35. The above rates are applicable from Monday to Friday from 07:30h up to the end of the workday. For Saturdays a surcharge of 20% is applied to the total hourly rate, with a minimum of 4 hours. This special rate is not possible on Sundays, on which we do not work. You can built this lift easy by yourselves. The Electric lift can reach up to 21 metres high. This is approximately the 5th floor. The Motor lift can reach up to 26 metres high. This is approximately the 7th or 8th floor. 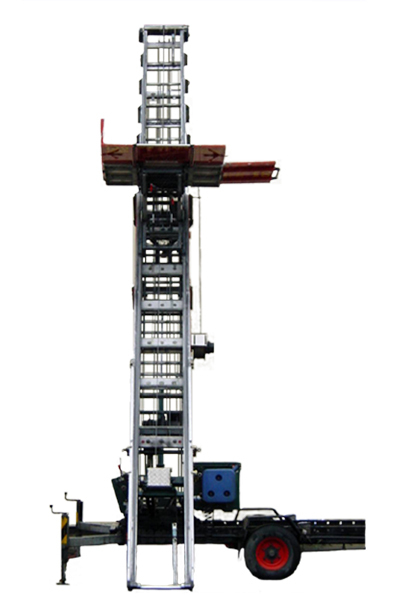 The maximum lifting capacity of this lift is 300 kilograms. Large cupboards, sofas and pianos can be moved up or down without any problem with this lift. The Motor lift is driven by a petrol engine so it does not need electricity.